This Nov gathering will be held at Kallang Wave. Here’s the first information. The monthly gathering serves as a platform for members to meet new and more SilverHairs friends. More details will be added here. MRT: Stadium station CC6 Exit A. Dress: as sporty as you like. After 6pm (watch for change in time), another activty will commence from Kallang Wave. Those interested in cycling can join DouglasC and AndrewK to rent a bic and cycle to Marina Barrage, a journey which is beautiful, scenic and refreshing. Those who wish to walk, you can also start from Kallang Wave, after the gathering at 6pm, and walk 3km to Marina Barrage. The tentative end point is Satay by the Bay. Members attending the gathering, please register here. Strictly members only. To a mother’s shock, losing her son cannot be more painful than anything else on this earth. Susan CH Tan’s son Gene Goh passed away this morning peacefully. Susan Tan is known to many SHC members. We offer her our support to go through this sad period. The wake is held at blk 227 Jurong East Street 21, spore 660227 until 12 Aug 3.30pm when Cortege leaves for Mandai. For those who can make it, let give our moral support to Susan Tan. On behalf of the SilverHairsClub, we wish all members and Singaporeans another proud day to remember, Our National Day. Next year 2019, we shall have “One night in Ho Chi Minh City”. We are likely to add a 5D4N itinery together with event. Our Club last trip was an all boys trip. It was hilarious. Dates I have in mind are pre-CNY or mid-Autumn festival. But generally flexible. Our trip will generally be in HCMC, and all the way to the Saigon River mouth to enjoy the majestic South China Sea and coastline. Motorcylists would enjoy this trip. If you have a tour company whom we can try, please yell. And if you like to join the planning team, plse whatsapp me. On this festive occasion, on behalf our the Club,our best wishes to all our Malay members and friends. I am looking for one or two members to manage our twitter and Instagram account. If you have experience using either of this social media platform, and would like to help the Club expand via other social media platforms, please contact me at Whatsapp +6594894360. 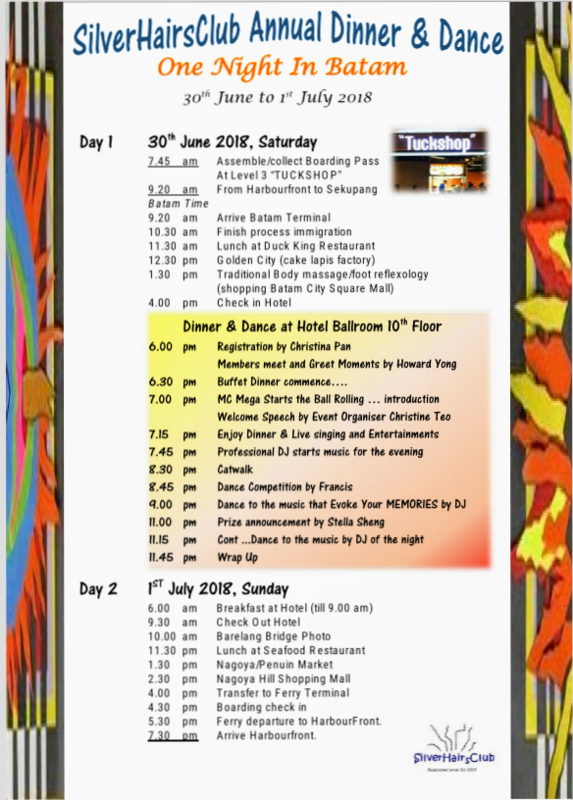 Next Thur 14 Jun 2018, we are having a birthday dinner celebration for members borned in the month of June. This will be a Zhe Zhar evening dinner in Chinatown area. The June babies have already organised themselves for this celebration, and we hope to have the same celebration every year. We had done this occasion once before. June babies who are interested to meet other June babies can contact Sue Chan directly, so that a seat can be allocated. Strictly for June babes only. ** Those borned on other months are encouraged to team together to have their birthday celebration. This is a great way to meet fellow members to celebrate our birthdays. About 80% of Singaporeans live in HDB flats on 99 year lease. Many of us fall within this category, and we can read in the media that many Singaporeans and PRs are concerned about the remaining lease years. Concerns include passing over to the next generation, ability to buy a used HDB flat when the balance lease is 40 – 60 years. Understanding the HDB flat is an asset and what 99 years lease means to retirees downsizing. Let’s say our HDB flat has 40 years left, what can we do with these 40 years? Let’s discuss, so that most of us can have a better understanding of this topic and it’s implication. The Ministry of Health has announced a new long term care insurance to be launched in 2020. SilverHairsClub has a discussion group starting 26 Feb 2018 for members on CPF life, Medishield and Eldershield. The group discussion is now closed. The new Whatsapp Careshield discussion starts 15 June 2018. This topic will end 15 Aug 2018. To participate, please register with whatsapp +65 9489 4360 with the msg “Careshield”. Registration closes 12 June 2018. 1. Strictly for SilverHairsClub members only. Participants are required to introduce your name and interest. 2. No URL, video clips, pictures. 3. No copy and paste. 5. No unrelated topic, except eldershield, medishield. A star * will be given for unrelated topic. A second star * means automatic exit.